So I went to a concert last night. And let me tell you: it was perfect. Hang on, I don’t think you understand. It was perfect. P-E-R-F-E-C-T.
Let me put this into perspective for you: Arctic Monkeys came onto the stage to the sound of KC & the Sunshine Band. That’s the way–uh huh! uh huh!–I like it, thankyouverymuch. Yes, I saw Arctic Monkeys live last night, and my life will never, ever be the same. What is this band? Seriously. We were in our seats about an hour before the show started–not because we were fighting for decent spots in GA (which would have been relatively easy to score) or we anticipated a massive amount of people or anything like that. Mostly because I wanted to land some free parking and avoid as many people as possible. This obsessiveness/anxiety resulted in the longest hour of my life. (Although I did get to hear this uber wicked cover of Macca’s “Monkberry Moon Delight”–one of my all-time fave Macca songs–by Screamin’ Jay Hawkins. Thanks, guys!) But once the lights dimmed and KC started singing, it was so worth it. Oh, was it ever worth it. This band is so good live. 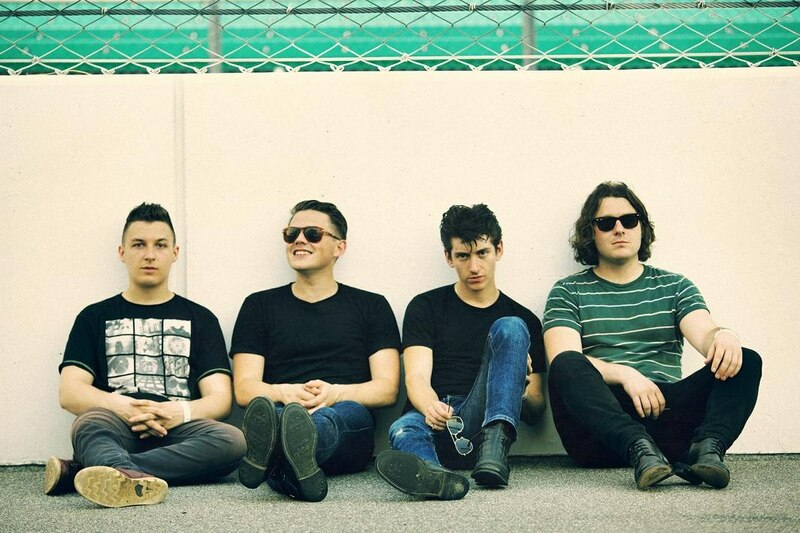 They are so tight as musicians (two words: Matt Helders), and Alex Turner’s voice is flawless live–which kind of surprised me, considering their aggressive touring schedule and well, I heard a rumor that smoking was bad for you. Maybe it is, but he sounded greeeeeeeeaaaaaaaaaaaaaat (plain old great is just too bland, see) last night. Arctic Monkeys opened their set opened with the blistering “Brianstorm,” and the storm really never stopped. It felt like a thunderstorm was literally shaking the building, but no, it was just Arctic Monkeys doing their thing. They never even slowed down, each song somehow louder, grittier than the previous. Oh, to be young and innocent again. 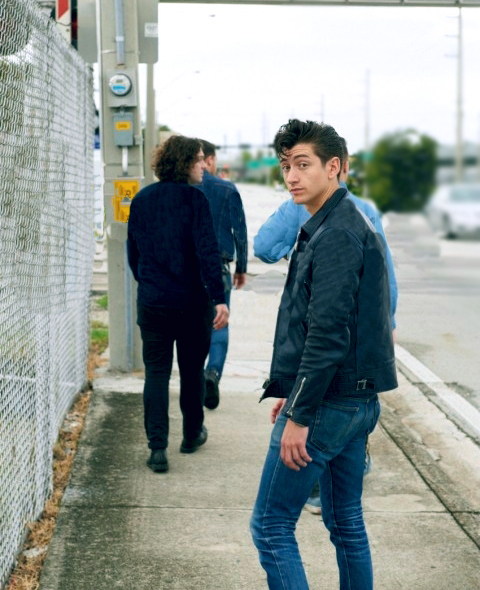 Alex Turner made sure everyone knew that they were Arctic Monkeys, Arctic Monkeys from High Green Sheffield, England. ‘Cos he told us two or three times. He was seemingly fascinated with saying Grand Rapids, Miiiiiiiiiichigan ‘cos I don’t have enough fingers and toes to count how many times he said that. Sounded good, though. “Did you come to party, Grand Rapids, Miiiiichigan?” he asked. No, we came to see you, silly. Oh, but that’s the same thing, isn’t it? Screeeeeeeeeam! Yeeeeeeeeeeeeeeeeah! Well, at least, there’s two of us here. It looked like we were at a concert with a bunch of zombies, it looked like we were the only ones standing up in our section, and it sure sounded like I was the only one who knew all the words to all the songs. (Awkward: the pause between “Presuming all things are equal who’d want to be men of the people, when there’s people like…” and I shout out, “You!” Uhhhh, you mean to tell me nobody else knows the words?) But that might be because most of the people there were waiting to see Black Keys and could really care less about Arctic Monkeys, Arctic Monkeys from High Green Sheffield, England. Oh, did I forget to mention that they were simply the opening band for Black Keys? Oops. And unfortunately, Alex kept reminding us they were just warming us up for the Black Keys, we were going to see the Black Keys soon, and they were going to leave us. I was so hyped up after they finished their set, my mind and body turned to jelly. I could hardly function. I could barely point and grunt at the tour program and t-shirt I wanted to buy. And then my legs did a funny thing. They left the building before the Black Keys even played a single note. I’m really sorry, Black Keys. I simply had no control. Arctic Monkeys stole my soul (keep it, dudes), and there was absolutely nothing I could do about it. It was a fan-tas-tic night, full of bangin’ tunes, Alex Turner practicin’ a magic trick, the Macarena, kung fu fightin’, and, of course, pointing. If only I were a Collins and could squander my family fortune on following Arctic Monkeys around on tour–in a non-creepy way, of course. And by non-creepy, I mean that it is my will to live. If I could be someone else for a week, I’d spend it chasing it after you. After years of rumors of a film adaptation, false production dates, and month after month of a single film still leaking one by one, an official trailer for Tim Burton’s Dark Shadows premiered on Ellen yesterday. I’m still scratching my head. The first thirty seconds or so of the trailer align most closely with the tone and story of the original series (and the 1990s reboot), but thereafter it is promoted as a comedy, something the original series certainly never aspired to be–although there are times when the original series was unintentionally funny, mostly due to the production constraints, and I think it endears the show. This is, of course, only a very limited glimpse of the film, and it is unclear whether this comic tone is emphasized in the trailer to attract a mass audience or the filmmakers simply took a lot of liberty with the source material. I hope it is the former. While I reserve final judgement until I see the full film (and I have faith that it isn’t all bad because Kathryn Leigh Scott, Lara Parker, David Selby, and Jonathan Frid all participated in the project), I find this trailer very disheartening. Barnabas Collins, as portrayed by Jonathan Frid, was kind and caring, vicious and cruel; he was a reluctant vampire with a heart. These flashes of Depp’s portrayal show none of that. He is, quite simply, a weirdo. We’ll see, though. Willie Loomis looks like he’s related to Peter Petigrew. I almost miss Jim Fyfe. Almost. Hey, John Karlen isn’t dead. WHY ISN’T HE IN THIS MOVIE? “Tell me, future dweller, what year is this?” “You may strategically place your wonderful lips upon my posterior and kiss it repeatedly!” “What sorcery is this? Reveal yourself, tiny songstress!” Uhhhhh, who talks like that? Barnabas always enjoyed long poetic musings in the drawing room, but this dialogue is a bit much, even if it is slightly amusing. Best character: Roger Collins. Woot woot! Let’s break out the brandy. The portrayal of Angelique is over-sexualized with none of the venom, charm, and depth of Lara Parker’s portrayal. I recently finished reading Return to Collinwood (which I will gush about soooooooooon), and Lara Parker wrote that she discussed the character of Angelique with Eva Green, who also recognized the character’s multiple layers. I do not see that in this trailer, but I hope it transpires in the film. Angelique threatens Barnabas if she cannot have him, she will destroy him and his family. And so it appears she is going to do that by destroying the Collins family business with a rival cannery. Hang on! Nobody ever worried about money or the family business on the original show (at least once Barnabas arrived), aside from the occasional mention of a business trip to Boston or Bangor from Roger. Ultimately, I’m disappointed with the trailer, but I’m not completely losing hope. There will (hopefully) be other trailers. See ya on May 11! It has now been more than a week since Davy Jones died at age 66 of a heart attack. My sister informed me via text message, musing, “The moobs is dead? Wtfruit.” She also wanted to know when I was ever going to post about Davy’s death, and I’ve hesitated, mostly because I’ve had trouble grasping why his death has had such a saddening effect on me. 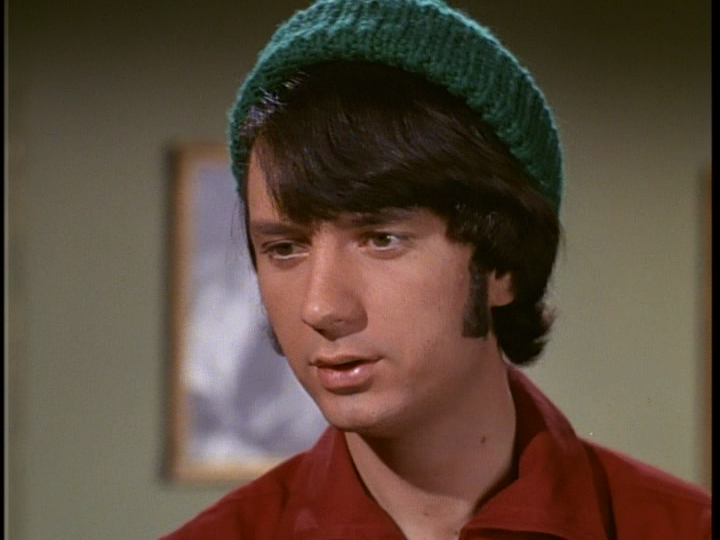 It wasn’t as if he were my favorite Monkee. It wasn’t as if I were going to attend one of his concerts. It wasn’t even as if I could not remember and enjoy his talents again and again through the music and my habitual marathons of The Monkees. But his death was still a grave shock, a shock that numbed my senses and ran twelve knives into my heart, seeming to kill part of my youth, which was full of love for his band, their wacky television show, and their music. Davy was always my least favorite Monkee–but that is not to say that I loathed him or failed to recognize his talents and value as a member of a very unique group. This is the man who absolutely makes my all-time favorite episode of The Brady Bunch (yep, I have ranked the episodes), which is saying something, considering the episode is packed with so many great moments: Bobby’s impersonation of Davy, Peter Brady (that’s it…just Peter Brady), Greg and Marcia posing as busboys, Carol stating definitively that Davy Jones is “the hottest thing since pepperoni pizza,” Alice reminiscing about her teenage love for Frank Sinatra, the younger kids mimicking Davy and Marcia’s smoochies, the younger kids singing “Girl” and prompting Mike to pay them a dollar to leave the house so he doesn’t have to listen to them. 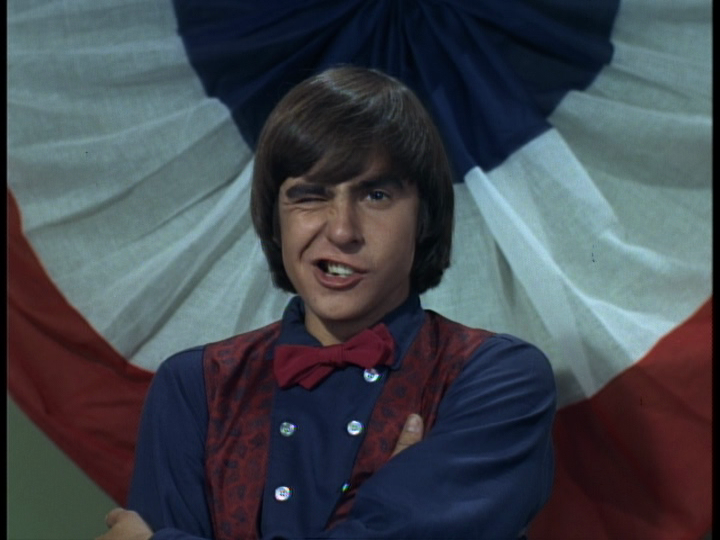 No, the best moments of the episode involve the real Davy Jones–recording “Girl” and overhearing Marcia’s plead with his manager and showing up at the Brady home. Reflecting on this episode recently, I found that it is actually very telling of who Davy Jones was. 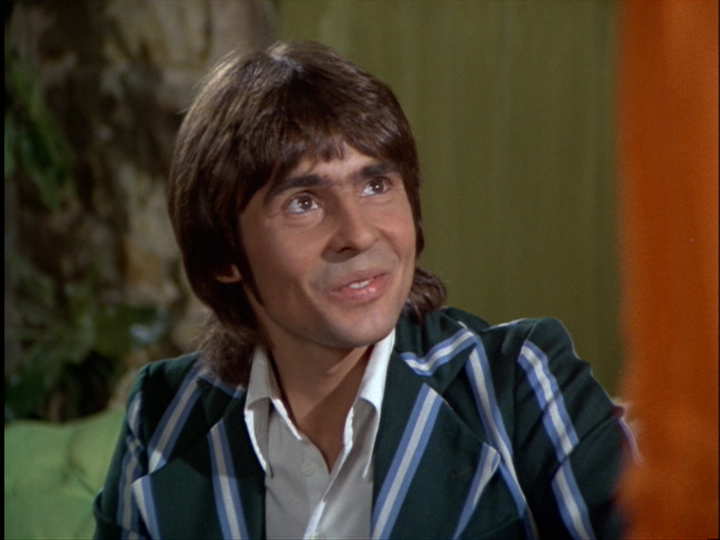 Here, Davy is overhearing Marcia explain her predicament to Davy’s manager–how Davy wrote a letter to her personally, promising if there was anything he could ever do for her to simply let him know and how, because of this letter, she has promised her school he would perform at their prom. 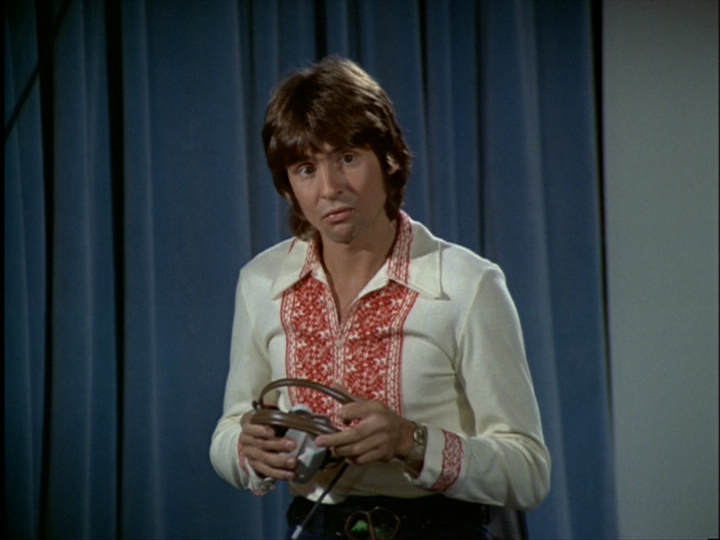 Davy’s manager isn’t buying it, but Davy is listening intently, aware of the torment he has caused Marcia. And he is prepared to take responsibility for his actions. Sure, this was all scripted, but it mirrors Davy’s real personality. He was always very generous to fans, making time for them and not making them feel inferior or as if they were inconveniencing him by asking him for a photo or autograph. There are several accounts of him visiting terminally ill fans of The Monkees during the 1960s, and he even flew to Arizona to visit a fan who had been holding a Monkees album when she was hit by a car. (Wow! That girl puts my obsession to shame.) 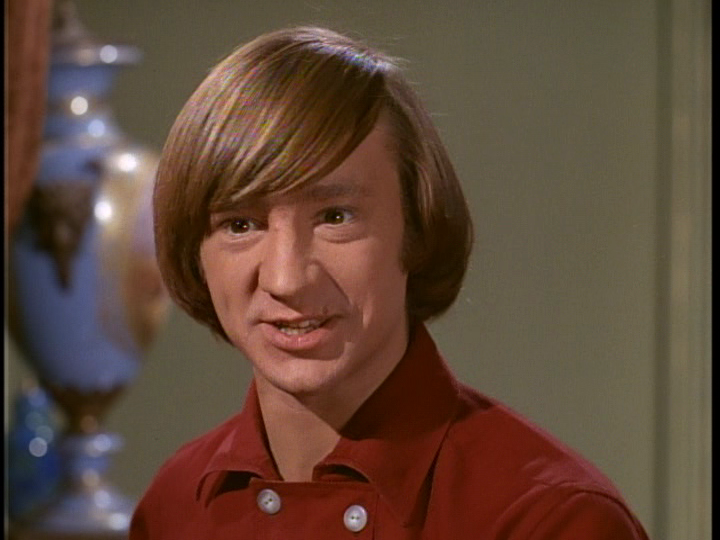 He was also incredibly generous and loyal to his family and friends, which, of course, included the other Monkees. Davy was always the most popular member and thus was immediately offered countless opportunities to embark on a solo career. 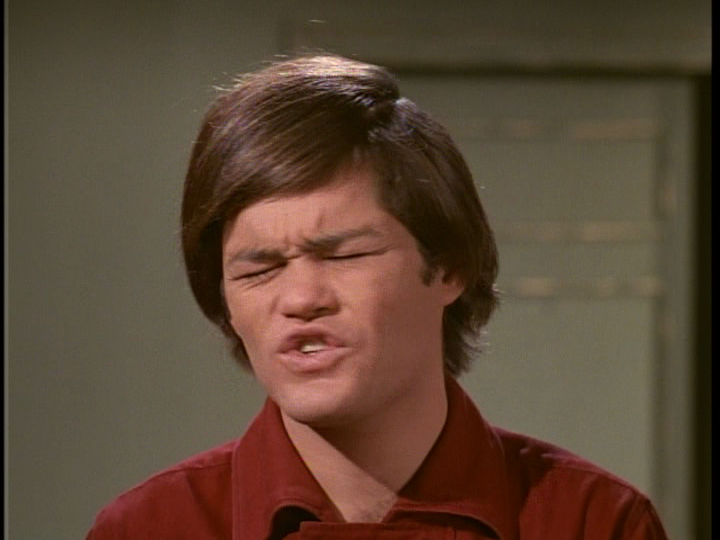 He refused them all–an incredible act of loyalty and solidarity with the others, traits that would manifest themselves again and again throughout the Monkees’ story and Davy’s life. It just wasn’t enough to sit and feel remorseful; Davy had to take drastic action to amend his mistake, even it meant going against his manager’s wishes. He shows up at the Brady home, with the album his grouchy manager promised Marcia, and talks to Marcia. What a guy! Again, this is only a television show and thus is easily rejected as “unrealistic.” But it again reflects on what kind of person Davy was–he cared about other people and was willing to go to any length to make them happy. Of the four Monkees, Davy was perhaps the one who was initially most willing to go along with the idea that “The Monkees” was simply a show and a job, not a real band. Davy, the youngest of the group, though, looked to the others as older brothers, and he saw how important creative control gradually became to all of them. He joined their fight to attain that creative control, no longer attempting to please both the powers that were (Don Kirschner) and the brothers he never had, just his brothers–because he cared about them and he would not be told what to do by some donuthole. Marcia Brady herself, Maureen McCormick, released this statement: “Davy was a beautiful soul who spread love and goodness around the world. He filled our lives with happiness, music, and joy. He will live on in our hearts forever. May he rest in peace.” Ditto. Reading through tributes posted by media outlets, I stumbled upon a thread of user comments, one remarking that the death of Davy was affecting them more than the deaths of Lennon and Harrison and another replying that while Davy’s death may be a greater personal loss his death ultimately does not hold the cultural weight of Lennon and Harrison because his band largely did not write or perform their own material. This kind of snobbery about authenticity has always surrounded The Monkees, and it probably always will. The death of Davy Jones did not affect me as much as the death of George Harrison, but then no death of any musician–aside from Paul McCartney and Ringo Starr–will affect me to the same degree. The impact and influence of the music of The Monkees does not equal that of The Beatles–but neither does the work of any other musicians. The authenticity and cultural value of Davy Jones and the Monkees is utterly irrelevant by this point. They have become so ingrained in the hearts of so many that it doesn’t matter whether studio musicians played on their first two albums, whether Neil Diamond wrote them a song or two, whether Jann Wenner deems them worthy of induction into the Rock ‘n’ Roll Hall of Fame. It doesn’t matter because they’ve already touched our lives, and we love them anyway. Davy once said that he wanted everyone who has met him to remember him in a different way and that if he hasn’t touched your life yet, he’ll be around. I’m grateful that he–and the Monkees–touched my life when I was so young, bringing me so much happiness through their music and humor. See ya, Davy. On the flip side. I don’t exactly know how to say this…but the totally coolest thing ever happened to me–oh, about ninety minutes ago. I went to the mailbox, expecting nothing but a wad of junk, only to find that the totally coolest thing ever was stuffed in my mailbox (along with a wad of junk but that’s okay). What’s the totally coolest thing ever? Yeah, I requested that she write that. But still. I think it’s really cool. 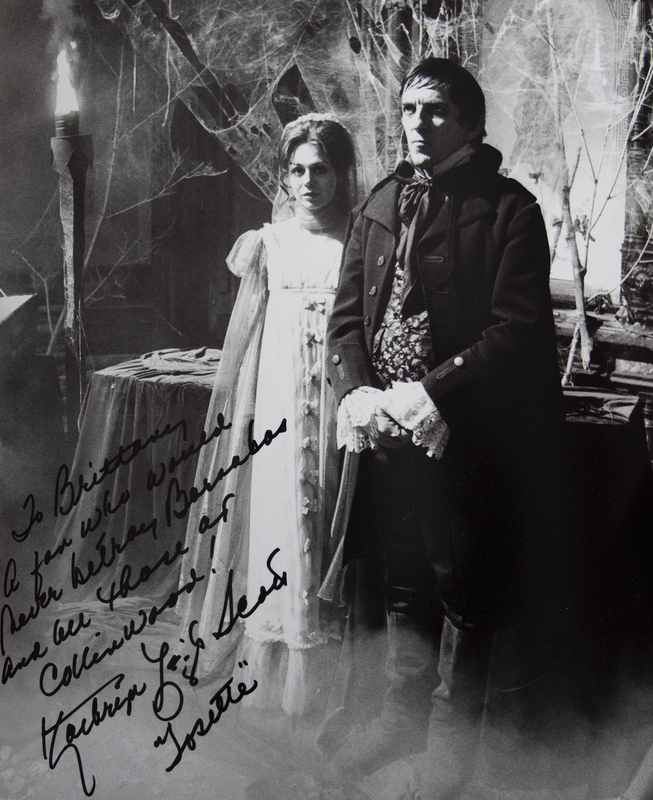 To coincide with the twentieth anniversary of Dark Shadows in 1986, Kathryn Leigh Scott wrote My Scrapbook Memories of Dark Shadows, founding her own publishing company, Pomegranate Press, in the process. Her company’s speciality is nonfiction books covering all aspects of the entertainment industry, which includes the latest addition to the company’s range of books about Dark Shadows, Return to Collinwood. The first 200 customers who pre-ordred this book through Pomegranate Press received the 8×10 promotional still of Maggie/Josette and Barnabas autographed by Kathryn Leigh Scott. As if I would order it from anywhere else. Return to Collinwood looks back on five decades of Dark Shadows, including the original series, the 1991 “revival” series, the failed attempt to re-launch the series again in 2004, and even the upcoming feature film starring Johnny Depp. It is filled with rare photographs and anecdotes from original cast members, including Jonathan Frid, David Selby, Lara Parker, and, of course, Kathryn Leigh Scott, all of whom also have cameos in the upcoming Burton-Depp film. I’m really looking forward to reading it and subsequently sharing my impressions of it with all of you. Thank you, Kathryn Leigh Scott, for making my day. And thank you, Dark Shadows, for creating a world filled with wonderful characters and stories that has allowed me time and time again to suspend disbelief and completely disappear into another, utterly enchanting universe. I’ll never, ever betray you. Sometimes you watch a film and you think, “Oh, that was pretty good.” Sometimes you watch a film and forget about it. And sometimes you watch a film and it never, ever leaves you. A Patch of Blue, starring Sidney Poitier and Elizabeth Hartman, is one of those films. Selina (Elizabeth Hartman) is a blind, uneducated white girl who suffers excruciating abuse at home from her mother, whom she calls Roseanne (played brilliantly by Shelley Winters, who won an Academy Award for Best Supporting Actress), and even her more sympathetic Ol’Pa. She stays home alone during the day, responsible for the housekeeping and stringing beads to sell. She has no friends, no social life, not even any knowledge of braille or how to navigate the world. Her Ol’Pa finally concedes her wish to visit the park one day, and there she meets Gordon (Sidney Poitier). Gordon helps relieve Selina’s terror of a caterpillar. Through Gordon, Selina experiences friendship and kindness. He teaches her how to cross a busy street, how to operate a telephone, even how to find the public restroom. As their friendship grows, Selina becomes deeply attached to Gordon, who cares for Selina but also understands the importance of her realizing her own independence. He becomes determined to not only be her friend but to help her escape her abusive environment. Selina, of course, never realizes that he is black, even when a discussion of race arises between them, until her racist mother discovers their friendship and confronts her, leading to one of the most abusive scenes in the film. The abuse and neglect Selina endures makes the film difficult to watch at times, only to be mollified by the sincere honesty and compassion of Gordon. As Poitier wrote, A Patch of Blue is a very human story. The story imparts the unjust racial prejudices prevalent in society, but I saw it as much more about humanity and the need for kindness and friendship, coupled with tolerance and understanding, in our world. Three of my favorite scenes illustrate this sentiment. Gordon introduces Selina to pineapple juice, something she has never tasted, and she falls in love with the beverage. After Gordon leaves to go to work, Selina waits for her Ol’Pa, who arrives late. She calls out, “Is anybody there?” She asks not because she is looking for help but because she wants to be sure no one is there so she might relieve herself. The next day, then, when Gordon again brings her pineapple juice, she refuses the drink. Gordon immediately understands, whispering that he can show her the way to the rest rooms. It is such a delicate subject, and the understanding and kindness with which Gordon handles it is simply beautiful. After grocery shopping together, Gordon fixes lunch for Selina at his home. Selina becomes enchanted with his grandmother’s music box, and she questions him about his grandmother and how she got the music box. The subject of love arises, and Selina tells Gordon of her experience with love–of how she was raped by a male “friend” of her prostitute mother. Selina speaks without fully understanding the gravity of what she is saying, and Gordon, horrified, cannot respond. “Are you still there?” she finally asks him. “I–I’m here,” is his succinct, touching reply. Gordon has left for work and Selina is again alone waiting for her grandfather. It begins to rain violently, and you feel the depth of Selina’s fear and isolation as she cries out for help. Gordon passes through by chance and leads her to a nearby gazebo. “Is it dark out?” she asks. “Yes,” Gordon tells her. “I’m glad,” she says, “because it makes you more like me.” She does not realize the breadth of their differences nor does she understand how similar they really are–each battling cruelty yet still approaching the world with respect and awe. Once the rain stops, Gordon helps Selina out of the gazebo, warning her of a step. “Don’t let go,” she pleads. “I won’t,” he promises. A Patch of Blue is as beautiful a film as its score, written by Jerry Goldsmith and nominated for an Academy Award. (Goldsmith was previously nominated for his work on Freud.) A Patch of Blue is both a love story and a social commentary, but is not melodramatic or unrealistic, like many romances, and it is not moralizing or finger-pointing, like many social commentaries. At its core, though, A Patch of Blue is simply a poignant story of kindness and cruelty, intolerance and understanding–a very human story indeed.